This postcard from the early 20th century speaks for itself. 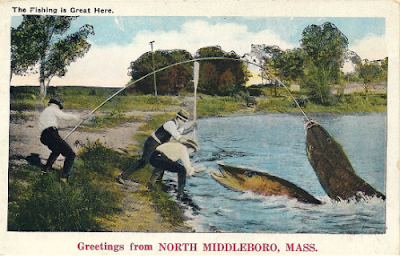 While North Middleborough was never a great destination for tourists for fishing, this humorous card seems to have been too funny to pass up. Generic cards such as these were printed in the hundreds of thousands and stamped with the individual locale at the bottom. Most likely, this card was sold in the North Middleborough store alongside more traditional picture postcards depicting the neighborhood.